The three returning crew members will climb into their Soyuz in the early hours on Friday with hatch closure scheduled for 6:25 UTC to be followed by the craft’s undocking at 9:49 UTC to mark the start of a free flight of two and a half hours to set up for a retrograde deorbit burn. 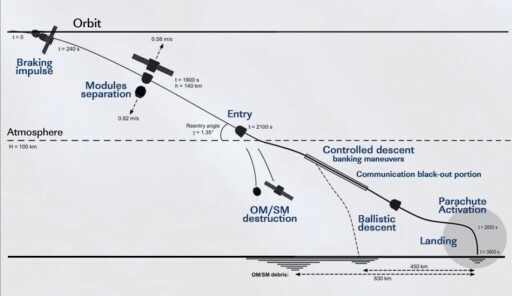 Hitting the brakes, Soyuz will fire its engines to slow down and place itself on a precisely planned re-entry trajectory. Going through a blazing re-entry, the returning crew members will have to endure forces of up to five Gs before their flight gets much calmer when the large orange-and-white main chute of the Soyuz inflates. The big finale of their return, touching down cushioned by the soft landing of the Soyuz, is expected at 13:12 UTC, two hours after sunset. 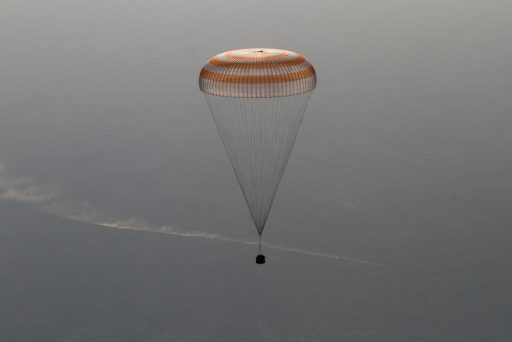 Typically, Soyuz landing are set up for the early morning or noon, local time, to provide sufficient time to recovery forces with plenty of daylight to a) locate the Soyuz, b) complete all crew-related operations in daylight and c) pack the Soyuz up and depart the site prior to nightfall. However, for a day landing, the orbital geometry has to be set up to allow the Soyuz to come in early in the morning which is not possible in December. Initially, the landing of the Soyuz was planned for the second half of December, closer to the local sunset, but this would have required a relocation of Soyuz TMA-17M because the inbound Soyuz TMA-19M can only make a six-hour launch-to-docking in the first half of December. 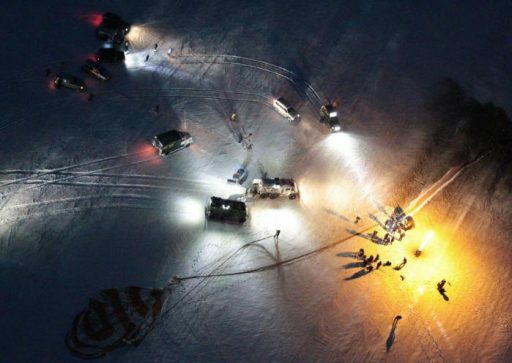 To avoid a relocation of the spacecraft, Russian Mission Managers approved this rare nighttime landing of the Soyuz, also owed to the accuracy seen in recent Soyuz landings which should enable recovery teams to quickly locate the spacecraft, even after nightfall. The most recent nighttime landing of the Soyuz was conducted in November 2012 when Yuri Malenchenko, Suni Williams and Aki Hoshide returned to Earth one hour prior to sunrise. 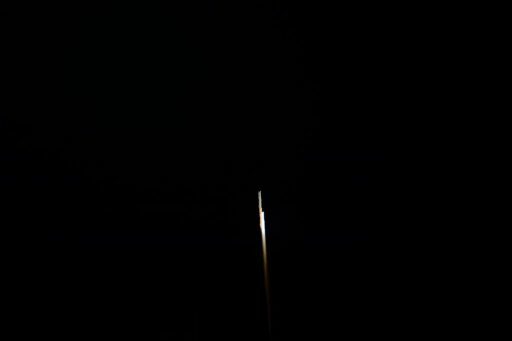 Even though Soyuz TMA-05M slightly overshot its bullseye landing target, the recovery of the crew proceeded swiftly and all three crew members were out of the Soyuz ahead of sunrise under illumination by a large emergency light tower that will again come to use on Friday. Soyuz TMA-17M will mark the fifth nighttime landing of a Soyuz returning from the International Space Station. The three returning crew members completed the usual preparations flow for their landing, starting about three weeks in advance with personal departure preparations, packing the Soyuz with return and disposal items and tagging up with recovery teams to get up to speed on the plans for their nighttime landing. 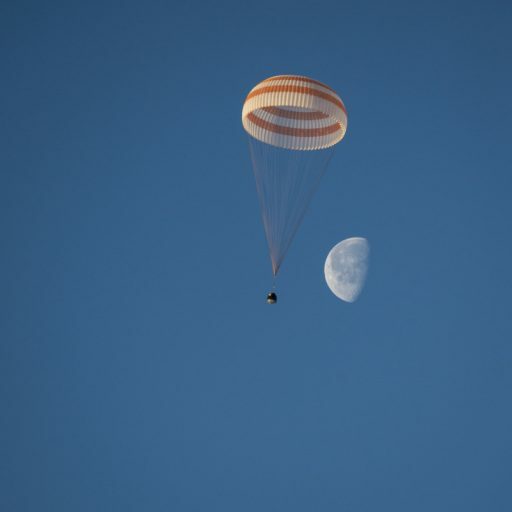 The crew also went through procedure reviews for their landing and the customary simulations of their upcoming descent inside their Soyuz spacecraft. They also went through leak checks of their Sokol Launch and Entry Suits and checked the fit of their Kazbek seat liners. This week, Soyuz TMA-17M completed the prescribed thruster test, firing each of its small thrusters for a short moment to make sure all were still operational after sitting idle for over four months. 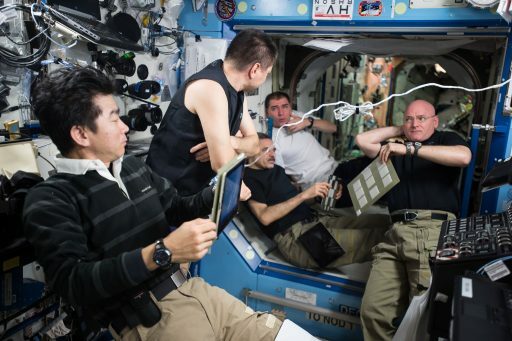 Having just captured the Cygnus OA-4 spacecraft on Wednesday, the crew aboard ISS worked a half day on Thursday to be able to have a very early start on Friday. In the early hours, UTC, Oleg Kononenko will power-up the Soyuz spacecraft and work through communication checks with the ground and configure the vehicle for free flight and landing, also placing the final return items aboard the small Entry Module. 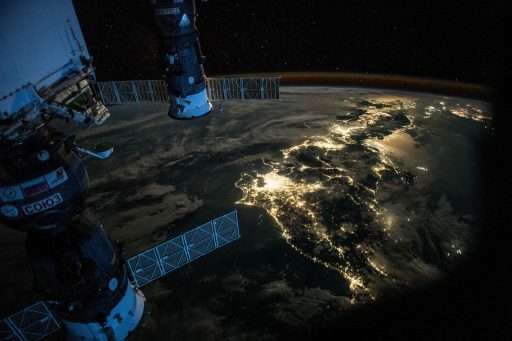 Mission Control will radio up to the crew a final update to the deorbit timeline based on the latest orbital trajectory computations using up to date tracking of the Space Station’s orbit. Around 6:25 UTC, the departing crew members will bid farewell to their colleagues who will remain in orbit until March. The Soyuz crew will float into their spacecraft and close the hatch of the Soyuz while the ISS crew closes the hatch of the Rassvet module after rubbing the seals with alcohol to make sure a pressure tight seal can be established. The standard one-hour leak check will see the depressurization of the small and large vestibule areas between the Soyuz spacecraft and the Rassvet module. While leak checks are in progress, the crew members will ingress their Sokol Launch and Entry Suits, radioing down to the ground pressure readings every five minutes. 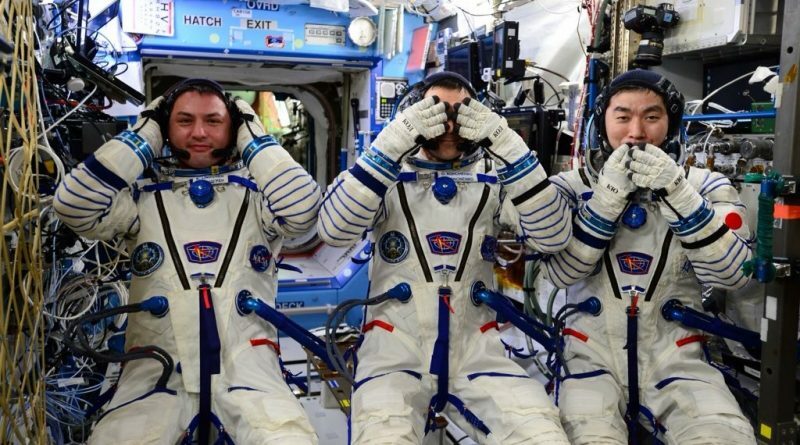 The crew trio will ingress their seats in the entry module with veteran Soyuz Commander Oleg Kononenko taking the center seat, flanked to the left by Kimiya Yui and to the right by Kjell Lindgren, both looking forward to their first return from space. When the hatch of the Entry Module is closed, the pressure of the Orbital Module will be vented down slightly so that a leak check between the two Soyuz modules can be conducted. 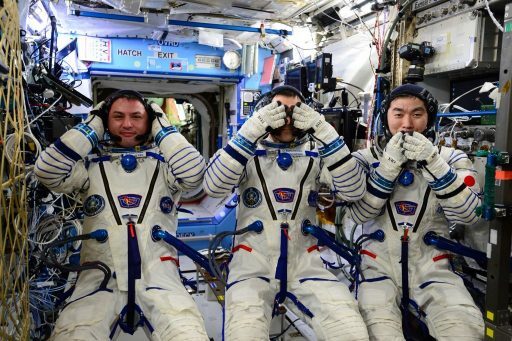 A leak check will also be performed by each crew member on their Sokol suit to make sure all are holding pressure to act as a last resort to keep the crew safe in the event of a cabin depressurization. Hooks on the Rassvet module will be opened so that Soyuz is only held in place by its own hooks and ISS will transition to the proper orientation for the undocking. The TMA-17M spacecraft will be transitioned to autonomous power and its Flight Control System will be switched to flight mode. Five minutes prior to undocking, the docking mechanism of the Soyuz will be powered up and the crew will issue the last set of commands to set up for separation. ISS will disable the Russian Thrusters one minute prior to the undocking command to prevent any thruster firings during the demating sequence – the USOS Control Moment Gyros will enter a Fine Attitude Hold mode for the undocking sequence. Upon receiving the undocking command at 9:48:00 UTC, the Soyuz will begin driving open its hooks leading up to physical separation that is commanded 90 seconds later by releasing a set of four loaded spring assemblies that deliver a force of around 300 Kilograms to push the Soyuz and ISS apart. The springs will enable the Soyuz and ISS to drift apart at a speed of 0.12 meters per second and the crew will keep a close eye on the spacecraft’s departure path to ensure it remains within the specified departure corridor. They will also check the docking mechanism on the ISS side to make sure no debris or damage is left behind as this mechanism will again be in use on Tuesday when Soyuz TMA-19M arrives at ISS. 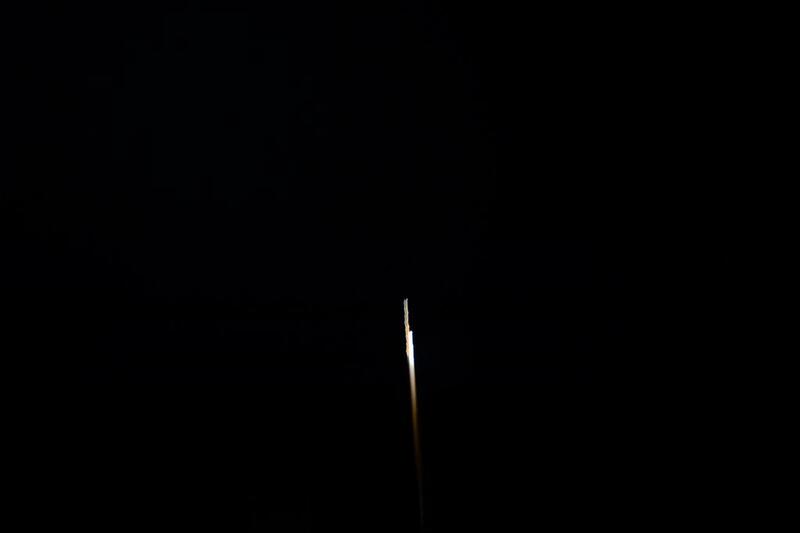 Soyuz will fire its engines twice to depart the Station, the first time around three minutes after separation when the craft is 20 meters from ISS followed by a quick roll maneuver to point the thrusters of the Soyuz to the correct direction for the second separation burn that is to take place 90 seconds after the first and deliver a thrust component along the velocity vector to put the Soyuz on its V-bar departure path. With the Soyuz on its way out of the ISS Approach Ellipsoid, the crew will complete a few reconfigurations to place Soyuz in its Free Flight Mode before settling down for two hours during which the Soyuz increases the gap to ISS to around 12 Kilometers. A VHF data and voice link will be maintained between ISS and Soyuz so that Mission Control can stay in contact with the crew.